If you've slept at a Holiday Inn Express ® then chances are that you've slept on the Blue Cord Soft or White Cord Firm pillows. These pillows are designed to give the best sleeping experience for side, back, and stomach sleepers.The Blue Cord Soft pillows are compressible making them great for stomach and back sleepers, while the White Cord Firm Pillows are springier and more supportive making them ideal for side and back sleepers. 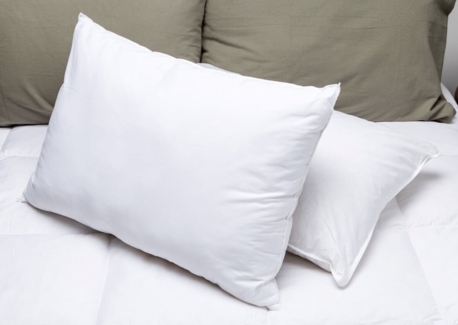 Find your ideal pillow with the Holiday Inn Express ® Soft and Firm Combo Pack! Please Note: The Holiday Inn ® and Holiday Inn Express ® Hotels are currently transitioning out of their current firm and soft pillows, and will soon be discontinued. As of now we are offering the replacements (new pillows) as the discontinued pillows go out of stock. Not to worry! These new pillows still offer the same great feel and comfort!